In a week marred by Carolina Panthers QB Cam Newton’s press conference comments, the former MVP played lights out against the Detroit Lions on Sunday. Newton threw for three touchdowns and 355 yards as the Panthers rushing game was bottled up all day and totaled just 28 yards on the ground. Newton hit rookie RB Christian McCaffrey and WR Devin Funchess in the first half and WR Kelvin Benjamin for a score in the second half and after a second Graham Gano field goal, had a comfortable 27-10 lead. However, Lions QB Matthew Stafford would not go quietly, leading Detroit to two fourth-quarter scoring drives, both touchdown tosses to TE Darren Fells. The Lions were on the brink of getting the ball back just before the two-minute warning in the fourth quarter, but a crucial Newton-Benjamin connection on third down clinched the 27-24 victory for Carolina. With that, we give you our PFF exclusive takeaways from the contest for each team. 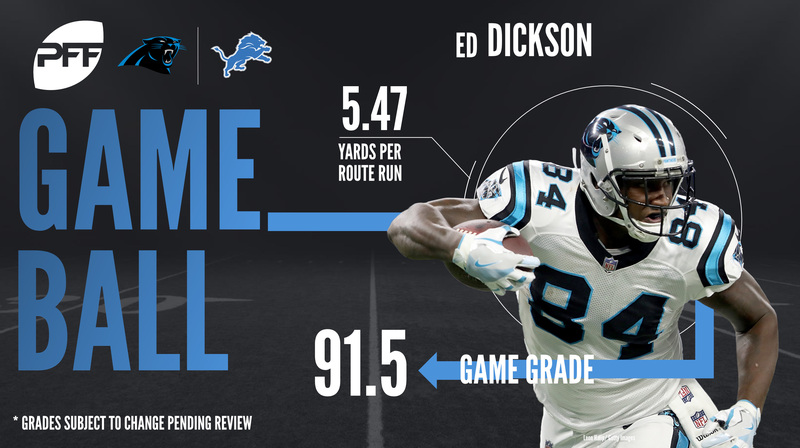 With Greg Olsen on IR, Ed Dickson had a career game. He caught all five targets for 175 yards and broke two tackles along the way. He had more yards against Detroit than he did in either of the past two whole seasons. While it can’t be expected for Dickson to have this type of performance each week, he does need to step up in OIsen’s absence, and he definitely did so today. Stewart forced four missed tackles on his three receptions, including a screen pass that picked up 21 yards for a first down. His rushing stat line of 18 carries for 21 rushing yards isn’t impressive, but he was given little-to-no help upfront. He was contacted at or behind the line of scrimmage on 15 of his 18 carries. He gained 48 yards after contact and forced five more missed tackles as a runner. While he didn’t pick up a ton of yardage, he did avoid losing yardage on several runs. Anytime an interior defender earns multiple sacks in a game, it gets your attention. Short actually racked up three of them, as he dominated the left side of the Lions offensive line. Short added an additional pressure and tackle to his stat line while causing fits in the run game. Tasked with covering Marvin Jones for most of the game, the second-year product out of Samford turned in the best game of his season. He allowed two catches on four targets for 19 yards and recorded a pass breakup. Yielding a passer rating of 63.5 when targeted against Detroit, Bradberry has yet to record an interception after picking off two as a rookie. While Stafford’s final stat line looks good completing 65.7 percent of his passes for 229 yards and 2 TDs, it was ball security in the pocket, a few errant throws and lack of Big Time Throws that brought his grade down. Coming into the game, Stafford was the seventh most pressured QB in the NFL at 39.7 percent but had done a good job avoiding sacks as he was the 16th most sacked QB when under pressure at 19.4 percent. The former first-overall pick out of Georgia wasn’t as fortunate today despite getting pressured less often than his season average with six sacks on 14 pressured dropbacks. While the offensive line struggled for most of the day, Wagner was the lone bright spot, as he kept the pocket clean until the Lions final drive of the game where he gave up a late pressure to Star Lotulelei on an inside stunt. The offseason acquisition has had an up-and-down first five weeks of the season in a new uniform, but he showed why the Lions shelled out big bucks for the former Baltimore Raven. After a below-average start to the season, Hayden had his highest graded game in coverage in years. He was targeted four times and made defensive stops on both catches that he allowed, which went for a combined one yard. He also broke up another pass along the sideline intended for Panthers running back Christian McCaffrey. While Hayden was playing well, Darius Slay was having his worst game of the season. Slay allowed five catches for 71 yards, two touchdowns, and Cam Newton had a near-perfect 155.6 passer rating when targeting Slay in coverage.